The most unusual, not to mention scary, assignment I had as an industrial photographer was working with an engineering firm inspecting Navajo Bridge. The bridge had been completed in 1929 and by the 1989 was showing its age. The inspection consisted of crawling around on the superstructure looking at every weld and bolt. My job was to photograph the engineers doing their work. 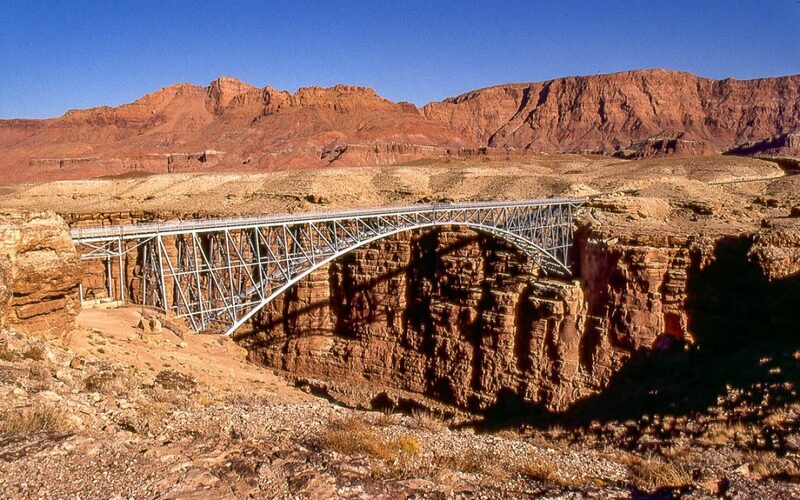 Navajo Bridge, originally called Grand Canyon Bridge, was the largest steel arch bridge in the world when it was completed. It provided a vital link between Utah and Arizona, replacing the ferry across the Colorado River five miles upstream. The dedication of the bridge took place in June of 1929. It was a momentous occasion. The two-day event in this isolated corner of Arizona was attended by over 7,000 people. Some 1200 cars made the journey over rough dirt roads. Speeches were delivered by the governors of four states-Arizona, Utah, Nevada and New Mexico. Bands played, choirs sang and native Americans presented their dances. The bridge was christened with a bottle of ginger ale since it was the era of Prohibition. Heber Jesse Meeks, a Kanab rancher and the stake president of the Church of Jesus Christ of Latter-day Saints had just returned from a mission to Alaska. He saw the dedication as an opportunity to link “the beautiful and alluring Southwest and the noble and sturdy Northwest.” To symbolize this union, he recruited two young people-Kenneth Judd of Kanab, Utah, and Betty Kastner of Prescott, Arizona-and performed a “marriage” ceremony in the middle of Navajo Bridge. With that, Kenneth was rewarded with a kiss from Betty to end the ceremony. It is not known if they ever saw each other again, but Mr. Northwest and Miss Southwest are forever joined by Navajo Bridge. 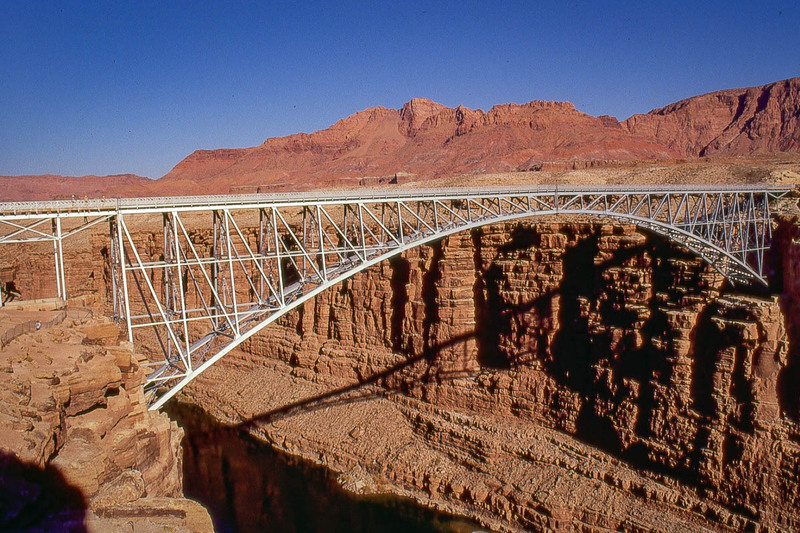 After 66 years of service, it became apparent that Navajo Bridge needed to be modernized. After much debate, it was decided to build a duplicate bridge downstream. The new bridge would have new, safer approaches and be over twice as wide to accommodate modern truck traffic. 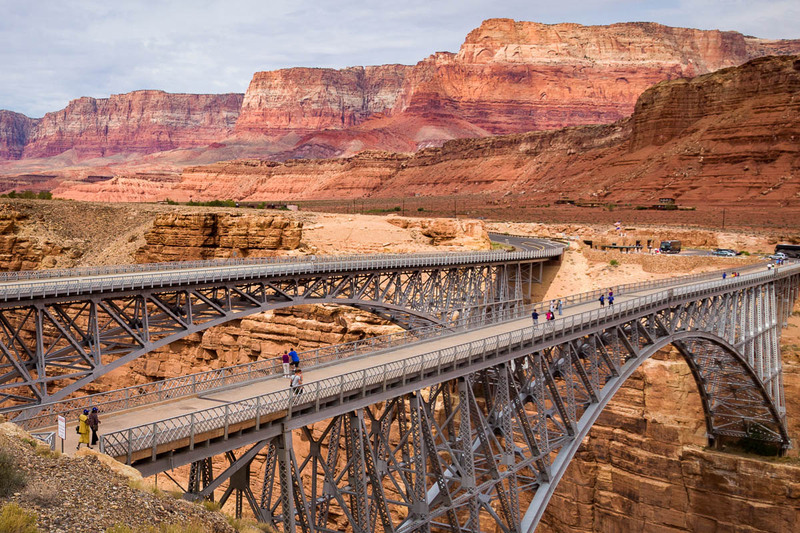 The old bridge remains so that visitors can walk out on it and marvel at Marble Canyon below. On the Navajo Nation (east) side of the bridge is an area where Native Americans display and sell their handcrafted jewelry, pottery and other crafts. On the west side there is an interpretive center in which historical, scientific and tourist information is provided by the Glen Canyon Natural History Association. To find your way to Navajo Bridge, go to the US 89A-Bitter Springs to Kanab Road Trip Guide. Very interesting. I am looking forward to a trip that will include much of US Route 89 in Utah and Arizona. I will be going over the part of the trail my ancestors took to go from Utah to Arizona. This trip included Lee’s Backbone.